Jaws (1975): Jaws is Steven Spielberg's breakout film and considered the first summer blockbuster. 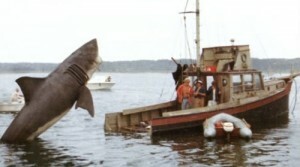 The fictional summer resort town of Amity Island is plagued by a deadly shark that has been attacking beachgoers. The danger is threatening to close down the town during peak tourist season. Richard Dreyfuss and Robert Shaw star as Matt Hooper and Quint, who are tracking the shark for a bounty. Jaws made $7 million its first weekend and was then the highest grossing film of all time and the first to make over $100 million in the theaters. Raiders of the Lost Ark (1981): The indomitable Indiana Jones, played by Harrison Ford, travels the world tracking down priceless artifacts. The film is set in the 1930s where he ends up fighting Nazi agents who are searching for the legendary Ark of the Covenant, which, if found, will make them invincible. It is then up to Indiana Jones to stop them. Spielberg was hitting his stride when Raiders of the Lost Ark premiered in 1981. No film or series better exemplified the fun and action of a Spielberg film than the Indiana Jones series. Spielberg collaborated with director George Lucas on Raiders and it was a mega hit in its time. Fans still watch and are passionate about Raiders of the Lost Ark and its sequels today. Schindler's List (1993): Spielberg won an Academy Award for Best Director, and Schindler's List took home the award for Best Picture in addition to awards for Cinematography and Sound Editing, among others. Schindler's List tells the story of Oskar Schindler, a Nazi industrialist who is credited with saving the lives of over a thousand Jewish people from the Holocaust during World War II. The film was an enormous success at the box office. Spielberg used the profits from the film to found the Shoah Foundation, a non-profit organization dedicated to recording the histories of people who survived The Holocaust. Schindler's List has also been named number 8 on the American Film Institute's Greatest American Films. Jurassic Park (1993): A When Dinosaurs Ruled the Earth banner flies across the screen at the climax of Jurassic Park. It is a wink to the audience and closes out Spielberg's film about an ill-fated expedition to a theme park featuring cloned dinosaurs brought to life. The visitors to the park are being stalked by two deadly Velociraptors and a giant Tyrannosaurus Rex - They must find a way to escape before they end up as the dinosaurs' next meal. Jurassic Park is based on the novel by Michael Crichton of the same name and ended up making $914 million worldwide. It has since been re-released in 3D and IMAX and filmgoers still flock to see Jurassic Park and its sequels in the theaters and on home video. Saving Private Ryan (1998): Spielberg's second film about World War II takes a look at the fighting that the soldiers endured and is an examination of the violence and death experienced during the war. A group of soldiers commanded by an army captain played by Tom Hanks is ordered to bring home a soldier named James Ryan after Ryan's three brothers are killed in combat. The soldiers resent that Private Ryan is being sent home while they are meant to keep fighting in the brutal war, but they dutifully go about trying to complete the mission. Saving Private Ryan is another box office success and was nominated for 11 Academy Awards. It won Best Cinematography, Best Sound, Best Sound Effects Editing, Best Film Editing, and Steven Spielberg won for Best Director. In his acceptance speech Spielberg acknowledged the families who lost loved ones in the war and thanked them for their sacrifice.